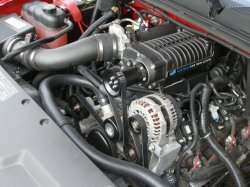 Lysholm 2007-2010 5.3L GM New Body Truck Tuner Kit  : Supercharger Superstore, Your Online Source for Vortech Superchargers, Paxton Superchargers, Procharger Superchargers, Magnacharger Superchargers and Techco Superchargers! Lysholm 2300 twin-screw supercharger with 3.80" pulley, integrated bypass valve and actuator. The twin-screw design provides maximum low-end torque as well as far greater efficiency and horsepower gains compared to the traditional (as well as newer) roots type blowers. Supercharger drive assembly includes idler, drive belt and all hardware. Fuel management upgrade includes extruded aluminum replacement fuel rails, high-flow fuel injectors and braided stainless steel fuel hoses. Integrated dual-pass air/water charge cooler configuration features a closed loop water cooling system with a stand alone pump, tank and front mounted heat exchanger. The aluminum charge cooler core features 50% more surface area than competitive kits for maximum temperature reduction. Cast Aluminum air inlet manifold mates to OEM throttle body. Roto-molded air inlet ducting maintains factory appearance and joins the stock air box and MAF. Complete bolt-on system includes all necessary belts, pulleys, fasteners and a reusable high-flow air filter. Tuner kits do not include fuel management/calibration upgrade. Fuel components and tuning must be provided by your installer.